The history of forcing fluoride on humans through the fluoridation of drinking water is wrought with lies, greed and deception. Governments that add fluoride to drinking water supplies insist that it is safe, beneficial and necessary, however, scientific evidence shows that fluoride is not safe to ingest and areas that fluoridate their drinking water supplies have higher rates of cavities, cancer, dental fluorosis, osteoporosis and other health problems. Because of the push from the aluminum industry, pharmaceutical companies and weapons manufacturers, fluoride continues to be added to water supplies all over North America and due to recent legal actions against water companies that fluoridate drinking water supplies, precedent has been set that will make it impossible for suits to be filed against water suppliers that fluoridate. There is a growing resistance against adding toxic fluoride to our water supplies, but unfortunately, because fluoride has become "the lifeblood of the modern industrial economy"(Bryson 2004), there is too much money at stake for those who endorse water fluoridation . The lies of the benefits of water fluoridation will continue to be fed to the public, not to encourage health benefits to a large number of people, but to profit the military-industrial complex. The story begins in 1924, when Interessen Gemeinschaft Farben (I.G. Farben), a German chemical manufacturing company, began receiving loans from American bankers, gradually leading to the creation of the huge I.G. Farben cartel. In 1928 Henry Ford and American Standard Oil Company (The Rockefellers) merged their assets with I.G. Farben, and by the early thirties, there were more than a hundred American corporations which had subsidiaries and co-operative understandings in Germany. The I.G. Farben assets in America were controlled by a holding Company, American I.G. Farben, which listed on it�s board of directors: Edsel Ford, President of the Ford Motor Company, Chas. E. Mitchell, President of Rockerfeller�s National City Bank of New York, Walter Teagle, President of Standard Oil New York, Paul Warburg, Chairman of the federal reserve and brother of Max Warburg, financier of Germany�s War effort, Herman Metz, a director of the Bank of Manhattan, controlled by the Warburgs, and a number of other members, three of which were tried and convicted as German war criminals for their crimes against humanity. In 1939 under the Alted agreement, the American Aluminum Company (ALCOA), then the worlds largest producer of sodium fluoride, and the Dow Chemical Company transferred its technology to Germany. Colgate, Kellogg, Dupont and many other companies eventually signed cartel agreements with I.G. Farben, creating a powerful lobby group accurately dubbed "the fluoride mafia"(Stephen 1995). At the end of World War II, the US government sent Charles Eliot Perkins, a research worker in chemistry, biochemistry, physiology and pathology, to take charge of the vast Farben chemical plants in Germany. The German chemists told Perkins of a scheme which they had devised during the war and had been adapted by the German General Staff. The German chemists explained of their attempt to control the population in any given area through the mass medication of drinking water with sodium fluoride, a tactic used in German and Russian prisoner of war camps to make the prisoners "stupid and docile"(Stephen 1995). Farben had developed plans during the war to fluoridate the occupied countries because it was found that fluoridation caused slight damage to a specific part of the brain, making it more difficult for the person affected to defend his freedom and causing the individual to become more docile towards authority. Fluoride remains one of the strongest anti-psychotic substances known, and is contained in twenty-five percent of the major tranquilizers. It may not seem surprising that Hitler�s regime practiced the concept of mind control through chemical means, but the American military continued Nazi research, exploring techniques to incapacitate an enemy or medicate an entire nation. As stated in the Rockerfeller Report, a Presidential briefing on CIA activities, "the drug program was part of a much larger CIA program to study possible means of controlling human behavior"(Stephen 1995). The �dental caries prevention myth� associated with fluoride, originated in the United States in 1939, when a scientist named Gerald J. Cox, employed by ALCOA, the largest producer of toxic fluoride waste and at the time being threatened by fluoride damage claims, fluoridated some lab rats, concluded that fluoride reduced cavities and claimed that it should be added to the nation�s water supplies. In 1947, Oscar R. Ewing, a long time ALCOA lawyer, was appointed head of the Federal Security Agency , a position that placed him in charge of the Public Health Service(PHS). Over the next three years, eighty-seven new American cities began fluoridating their water, including the control city in a water fluoridation study in Michigan, thus eliminating the most scientifically objective test of safety and benefit before it was ever completed. American �education and research� was funded by the Aluminum Manufacturing, Fertilizer and Weapons Industry looking for an outlet for the increasingly mounting fluoride industrial waste while attaining positive profit increase. The �discovery� that fluoride benefited teeth, was paid for by industry that needed to be able to defend "lawsuits from workers and communities poisoned by industrial fluoride emissions" (Bryson 1995) and turn a liability into an asset. Fluoride, a waste constituent in the manufacturing processes of explosives, fertilizers and other �necessities�, was expensive to dispose of properly and until a �use� was found for it in America�s water supplies, the substance was only considered a toxic, hazardous waste. 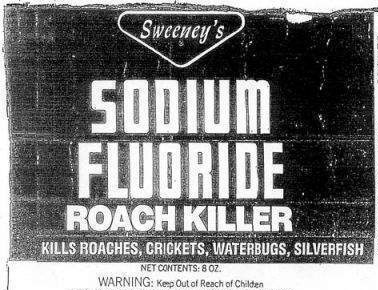 Through sly public re-education, fluoride, once a waste product, became the active ingredient in fluorinated pesticides, fungicides, rodenticides, anesthetics, tranquilizers, fluorinated pharmaceuticals, and a number of industrial and domestic products, fluorinated dental gels, rinses and toothpastes. Fluoride is so much a part of a multibillion-dollar industrial and pharmaceutical income, that any withdrawal of support from pro-fluoridationists is financially impossible, legally unthinkable and potentially devastating for their career and reputation. Funded by US industrialists, in an attempt to encourage public acceptance of fluoride, Edward Bernays, known also as the father of PR, or the original spin doctor, began a campaign of deception to persuade public opinion. Barnays explained "you can get practically any idea accepted if doctors are in favour. The public is willing to accept it because a doctor is an authority to most people, regardless of how much he knows or doesn�t know"(Bryson 2004). Doctors who endorsed fluoridation didn�t know that research discrediting fluoride�s safety was either suppressed or not conducted in the first place. Fluoride became equated with scientific progress and since it was introduced to the public as a health-enhancing substance, added to the environment for the children�s sake, those opposing fluoride were dismissed as cranks, quacks and lunatics. Fluoride became impervious to criticism because of a relentless PR offensive, but also because of it�s overall toxicity. Unlike chemicals that have a signature effect, fluoride, a systemic poison, produces a range of health problems, so it�s effects are more difficult to diagnose. Recently declassified US Military documents such as Manhattan Project, shows how Fluoride is the key chemical in atomic bomb production and millions of tonnes of it were needed for the manufacture of bomb-grade uranium and plutonium. Fluoride poisoning, not radiation poisoning, emerged as the leading chemical health hazard for both workers and nearby communities. A-bomb scientists were ordered to provide evidence useful for defense in litigation, so they began secretly testing fluoride on unsuspecting hospital patients and indignant, mentally retarded children.. "The August 1948 Journal of the American Dental Association shows that evidence of adverse effects from fluoride was censored by the US Atomic Energy Commission for reasons of "national security" (Griffiths 1998). The only report released stated that fluoride was safe for humans in small doses. During the Cold War, Dr. Harold C. Hodge, who had been the toxicologist for the US Army Manhattan Project, was the leading scientific promoter of water fluoridation. While Dr. Hodge was reassuring congress of the safety of water fluoridation, he was covertly conducting one of the nation�s first public water fluoridation experiments in Newburgh, New York, secretly studying biological samples from Newburgh citizens at his US laboratory at the University of Rochester. Since there are no legal constraints against the suppression of scientific data, the only published conclusion resulting from these experiments was that fluoride was safe in low doses, a profoundly helpful verdict for the US Military who feared lawsuits for fluoride injury from workers in nuclear power plants and munitions factories. Fluoride pollution was one of the biggest legal worries facing key US industrial sectors during the cold war. A secret group of corporate attorneys, known as the Fluorine Lawyers Committee, whose members included US Steel, ALCOA, Kaiser Aluminum, and Reynolds Metals, commissioned research at the Kettering Laboratory at the University of Cincinnati to "provide ammunition"(Bryson 2004) for those corporations who were fighting a wave of citizen claims for fluoride injury. The Fluorine Lawyers Committee and their medical ambassadors were in personal and frequent contact with the senior officials of the federal National Institute for Dental Research, and have been implied in the �burying� of the forty year old Kettering study, which showed that fluoride poisoned the lungs and lymph nodes in laboratory animals. Private interests, sought to destroy careers and censor information by ensuring that scientific studies raising doubts about the safety of fluoride never got funded, and if they did, never got published. During the 1990�s, research conducted by Harvard toxicologist Phillis Mullenix showed that fluoride in water may lead to lower IQ�s, and produced symptoms in rats strongly resembling attention deficit and hyperactivity disorder (ADHD). Just days before her research was accepted for publication, Mullenix was fired as the head of toxicology at the Forsyth Dental Center in Boston. Then her application for a grant to continue her fluoride and central nervous system research was turned down by the US National Institute of Health (NIH), when an NIH panel told her that "fluoride does not have central nervous system effects"(Griffiths 1998). Despite growing evidence that it is harmful to public health, US federal and state pubic health agencies and large dental and medical organizations such as the American Dental Association (ADA), continue to promote fluoride. Water fluoridation continues, despite the Environmental Protection Agency (EPA)�s own scientists, whose union, Chapter 280 of the National Treasury Employees Union, has taken a strong stand against it. Dr. William Hirzy, vice president of Chapter 280, stated that "fluoride (that is added to municipal water) is a hazardous waste product for which there is substantial evidence of adverse health effects and, contrary to public perception, virtually no evidence of significant benefits"( Mullenix 1998). Although fluoride is up to fifty times more toxic than sulfur dioxide, it is still not regulated as an air pollutant by the American Clean Air Act. Since thousands of tonnes of industrial fluoride waste is poured into drinking water supplies all over North America, supposedly to encourage gleaming smiles in our children, big industry in the US has the benefit of emitting as much fluoride waste into the environment as they like with absolutely no requirement to measure emissions and no way of being held accountable for poisoning people, animals and vegetation. In August 2003, the EPA requested that the National Research Council, the research arm of the National Academy of Sciences (NAS), re-evaluate water fluoride safety standards by reviewing recent scientific literature, because the last review in 1993 had major gaps in research. "Neither the US Food and Drug Administration (FDA), nor the National Institute for Dental Research (NIDR), nor the American Academy of Pediatric Dentistry has any proof on fluoride�s safety or effectiveness"(Sterling 1993). The International Academy of Oral Medicine and Toxicology has classified fluoride as an unapproved dental medicament due to it�s high toxicity and the US National Cancer Institute Toxicological Program has found fluoride to be an "equivocal carcinogen" (Maurer 1990). Currently the US government is continuing to introduce further fluoridation schemes throughout the country, including the Water Act passed in November 2003, which has made it impossible for water companies to undergo civil or criminal hearings as a result of adding fluoride to public water supplies. In a society where products containing asbestos, lead, beryllium and many other carcinogens have been recalled from the marketplace, it is surprising that fluoride is embraced so thoroughly and blindly. It seems absurd that we would consider paying the chemical industry to dispose of their toxic waste by adding it to our water supply. Hiding the hazards of fluoride pollution from the public is a capitalist-style con job of epic proportions that has occurred because a powerful lobby wishes to manipulate public opinion in order to protect it�s own financial interests. "Those who manipulate this unseen mechanism of society constitute an invisible government which is the true ruling power of our country... our minds are molded, our tastes formed, our ideas suggested, largely by men we have never heard of" (Bernays 1991).